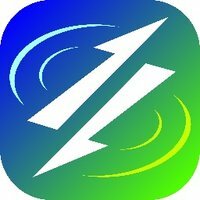 Was the small but strong shock in southern Japan a random event? In the late evening on January 3, a M=5.1 earthquake caused strong local ground shaking (JMA Intensity 6-, equivalent to MMI Intensity IX-X) in Nagomi-machi, ~25 km north of Kumamoto City (Fig. 1). Although the quake brought only light damage to the town, it stopped the Shinkansen ‘bullet trains’ and highway services for an emergency check-up during Japan’s well-traveled New Year holiday. Figure 1. JMA intensity distribution of the January 3 M=5.1 earthquake. At the epicenter (X), the shaking reached JMA 6-. Japan’s Headquarters for Earthquake Research Promotion (HERP) declares the M=5.1 to be unrelated to the 2016 M=7.0 shock. We beg to differ. This quake recalls the devastating 2016 Mw=7.0 (Mjma=7.3) Kumamoto earthquake that killed 50 people and destroyed thousands of houses (Hashimoto et al., 2017). 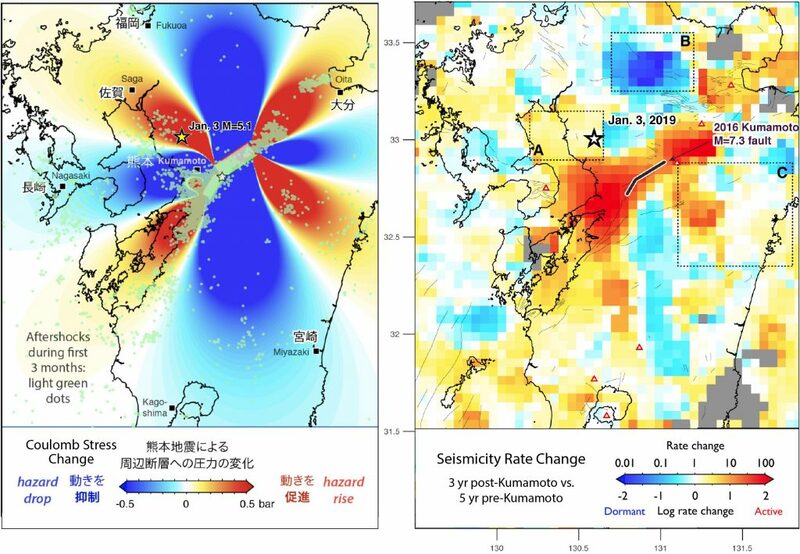 Immediately after the M=5.1 shock, HERP (2019) announced that there is no causal relation between the 3 Jan 2019 shock and the 15 April 2016 Kumamoto earthquake. In contrast, we contend that the M=5.1 is instead part of the long-lasting and remarkably widespread aftershock sequence of the M=7.0 Kumamoto earthquake. Figure 2. (Left panel) Coulomb stress imparted by the 2016 Kumamoto earthquake sequence to the surrounding crust as a result of the combined Mw=6.0 and Mw=7.0 shocks. This figure was originally posted in a Temblor blog (Stein and Toda, 2016). Regions in which strike-slip faults are brought closer to failure are red (‘stress trigger zones’); regions now inhibited from failure are blue (‘stress shadows’). Aftershocks during first three months (translucent green dots) generally lie in regions brought closer to failure. The January 3 event (yellow star) is located in one of the stress trigger zones. In the web article of the IRIDeS Tohoku University released immediately after the 2016 shock (IRIDeS, 2016) and our blog article posted on September 2, 2016 (Stein and Toda, 2016), we emphasized the effect of Coulomb stress transfer to nearby regions (warmer color regions in Fig. 2 left panel), and mentioned the initial aftershocks mostly occurred in the regions where we calculated that the Coulomb stress increased. The Jan 3, 2019 M=5.1 shock indeed occurred in one of the stress increased lobes (yellow star in Fig. 2). This lobe experienced an increase in seismicity after the Kumamoto mainshock (Box A in Fig. 3 below). Figure 3. Epicenters of all earthquakes shallower than 20 km during the period of 2015-2018 (JMA catalog). Although there are several dense clusters that have nothing to do with the Kumamoto earthquake, we nevertheless see that the aftershock zone is extends up to five rupture lengths from the fault (thick black line). The three boxes are where we examined the seismicity over time in Figure 4. The quake rate doubled in the stress trigger zone of the 2016 Mw=7.0 quake, and dropped by a factor of 5 in its stress shadow. Given that Japan is such an earthquake-prone country, one could argue that it was simply a random accident that the M=5.1 quake struck in the stress trigger zone. To address this possibility, we first examined the change in earthquake occurrence rate (‘seismicity rate change’) before and after the 2016 Kumamoto earthquake (Fig. 2 right panel). A visual comparison of our Coulomb calculation (Fig. 2 left panel) with seismicity rate change (Fig. 2 right panel) shows they match reasonably well. The epicenter of the 3 January 2019 event is in the red spot on both maps. Furthermore, regions north and south of the 2016 rupture zone, in which the faults were inhibited from failure by the stress changes, indeed show a seismicity decrease. 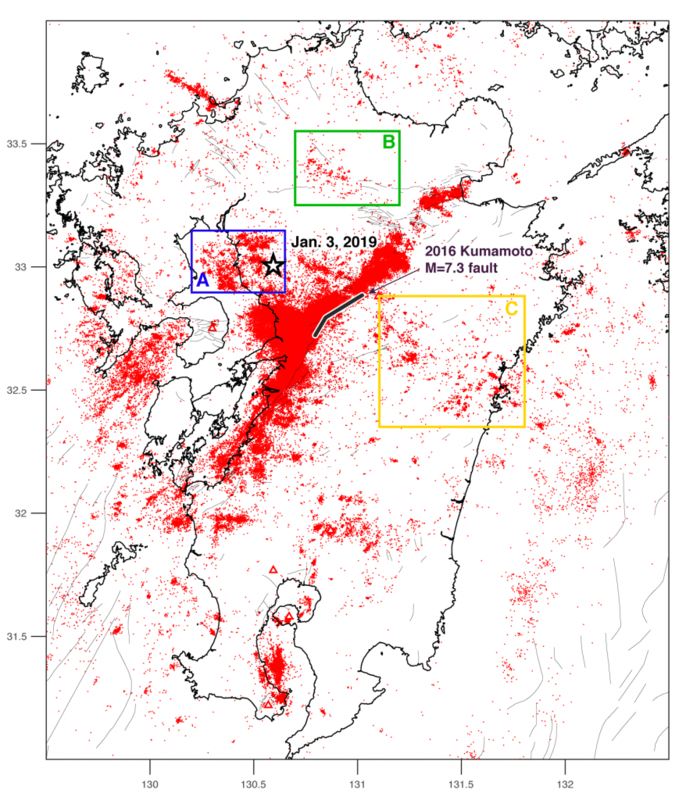 To make sure that the local seismicity responded to the Kumamoto earthquake and not some other event at roughly the same time, we have chosen three sub-regions (boxes in Fig. 3) and looked at their seismicity time series (Fig. 4). In box A, the number of shocks, most of which are very small, was ~600 a year before the 2016 mainshock. But it has risen by over 2, to ~1500 per year since the mainshock. Thus, the M=5.1 event occurred in the zone of sustained higher rate of seismicity associated with the 2016 Kumamoto earthquake. 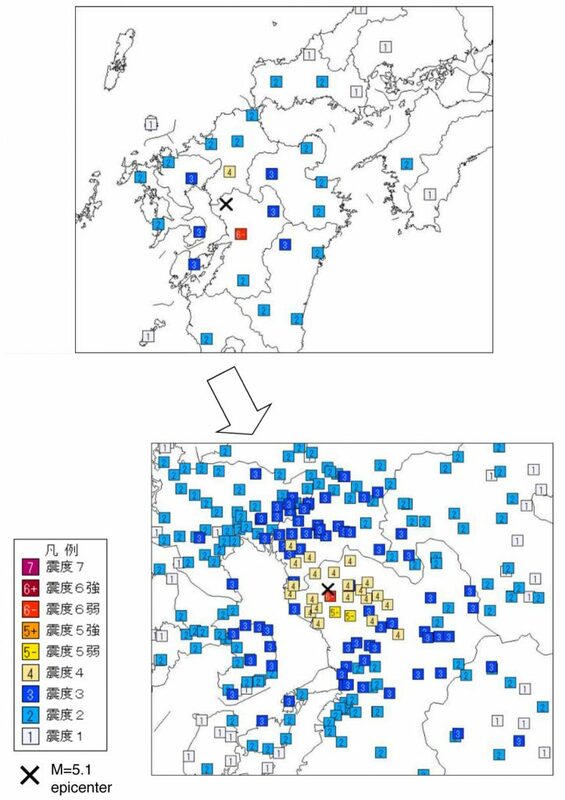 A similar continuous and long-lasting seismicity increase also occurred in box C (northern Miyazaki Prefecture) where Coulomb stress was also imparted by the mainshock. The opposite response is observed in box B, where Coulomb stress was calculated to have decreased. There, the seismicity plummeted to 1/5 of the pre-Kumamoto level. Figure 4. Seismic time series in the particular sub-regions, A, B, and C, corresponding to the boxes in Fig. 2 left panel and Fig. 3. The blue line indicates cumulative number of earthquakes since 2015 (with the corresponding blue scale at left), whereas the green stems identify each earthquake time and magnitude (green scale at right). What’s clear is that in all cases, the seismicity rates changed roughly at the time of the 2016 Kumamoto mainshock, and in the manner forecast by the Coulomb stress changes. There is a caveat that the Japan Meteorological Agency (JMA) has changed their earthquake determination algorithm after April 2016. However, it should have been homogeneously implemented in Kyushu. Since we confirmed the regional-dependent seismic behaviors in Fig. 4, we do not think the increased seismicity in the box A in Fig. 4 is an artifact. We also note that the rate of shallow M≥5 earthquakes under inland Japan (378,000 km2) is roughly about 10 a year. It enables us to say the probability to have one M≥5 quake in the box A (1168 km2) per year is ~3%, and so it is rare enough to make an accidental or coincidental occurrence unlikely. The long-lasting and far-reaching impact of stress transfer on seismic hazard. A key lesson learned from this M=5.1 quake is the effect of stress disturbance due to the three-year-old M=7 event continues over a large area in central Kyushu. 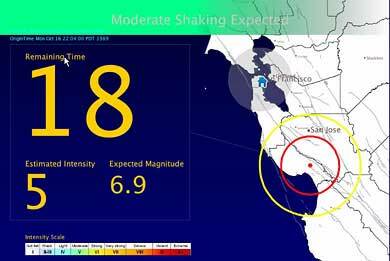 And even though the size of the January 3 quake is much smaller than the M=7.0, it can nevertheless cause serious damage. Further, aftershocks do not get smaller with time after a mainshock; instead they only get more spaced out in time. So, a larger shock could still strike. The most likely place for such an event is unfortunately the highly-populated Kumamoto city, because there the stress imparted by the 2016 mainshock was greater than anywhere else.